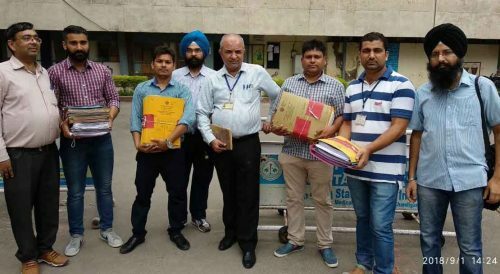 Chandigarh 1st September; Though, PGI Management filed writ petition on 29th August, which was listed on 30th and notices were issued to Unions / Associations for 31st August. On 31st August, Unions / Associations raised an objection that the present writ petition is premature and misconceived and PGI Management has not approached Labour Commissioner for Conciliation Proceedings under Section 12 of ID Act, 1947. On 31.8.2018, Labour Commissioner received letter from PGI Management for intervention / necessary action. On the instant day, Labour Commissioner sent a notice for discussions / conciliation proceedings between the parties on Saturday, 01.09.2018 at 3 PM, though it was holiday, under Section 12 of ID Act, 1947 through email dated 31.08.2018 (12:44 PM). Though, the Unions / Association reached Office of Labour Commissioner but in a planned conspiracy, the PGI Management did not attend the Conciliation Proceedings fixed for 01.09.2018 at 3 PM on the plea that the matter is sub-judice now in High Court whereas the writ petition was filed on 29th August, 2018 itself. It is sufficient to prove that PGI Management does not a peaceful settlement of industrial disputes across the table and is responsible to spoil congenial and cordial atmosphere at the Institute.